How are you called to evangelize? Christ is Risen! He is Truly Risen! One of the most beautiful and moving moments at the Paschal Vigil on Holy Saturday is when the women and men who have come to faith in Jesus Christ are baptized, confirmed and receive the Eucharist for the first time. What we do on that night is the culmination of a journey that began when they were first evangelized, that is, when, through the power of the Holy Spirit they initially said “Yes” to Jesus and entrusted themselves to him. It’s a daunting task. But providentially, we have both grace and nature on our side to assist us. Bishop Robert Barron, echoing the teaching of St. Thomas Aquinas, and before him, the Greek philosopher Aristotle, famously (and repeatedly) has stressed the importance to evangelization of our inborn longing for truth, goodness and beauty. He notes that not only do we long for truth, goodness and beauty, but that this longing, is in fact, an insatiable longing that can only be satisfied by ultimate Truth, ultimate Goodness and ultimate Beauty, that is to say, by God. For us as Christians, God revealed fully and perfectly in the person of Jesus, the incarnate Word, Savior and Redeemer of the world. All around us, as a kind of pre-evangelization, is the truth, goodness and beauty found in creation and in human endeavor which provides those who seek God a way into the Divine. But what the Church means by evangelization is not simply a general affirmation of divine truth, goodness and beauty in the created and human realities around us. Rather, to evangelize, which is why the Church exists in the first place, is an active and dynamic proclamation of the Good News of Jesus Christ, which invites men and women to conversion and faith. 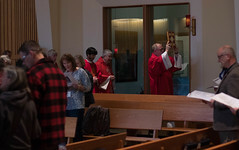 When at Easter the catechumens mystically die and rise with Christ in the waters of baptism, are anointed with the gift of the Holy Spirit and receive the holy mysteries of the Lord’s Body and Blood, they do so not only for the sake of their own personal salvation and holiness but to enable them to become missionary disciples. When we, the baptized, renew our baptismal promises at the Easter Vigil or on Easter Sunday, we renew our commitment to missionary discipleship. Missionary discipleship, the call to order our lives, our choices and our activities to the great commission of Jesus to “go and make disciples of all nations,” to proclaim the Good News, is not a special vocation within the Church, but the calling and responsibility of all the baptized. Nor is it ever optional. It’s important to stress (because of a common misunderstanding in our culture) that authentic evangelization is never coercive or manipulative. Nor does it have a hidden agenda. For example, charity, especially on behalf of the poor and the marginalized, is an essential dimension of the Church’s evangelizing mission. But the love and compassion of Jesus Christ, embodied in Christian charity, has no strings attached. The Good News which we received in freedom must be freely given and received by those we witness to. While the mission of evangelization to everywhere and at all times “proclaim the name, the teaching, the life, the promises, the Kingdom and the mystery of Jesus” (Evangelii Nuntiandi no.42) is at the heart of following our Risen Savior, the particular way in which we engage in missionary discipleship depends on our particular circumstances, gifts and abilities, way of life and time of life. 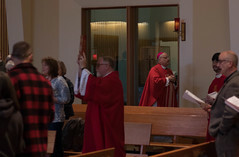 Each of us, by virtue of our baptism, is called to place our unique gifts, virtues and talents at the service of the Church’s mission of evangelization, confident that whatever we offer with a sincere heart, the Holy Spirit will put to good use. We can be confident that the truth, goodness and beauty of Jesus, incarnated in and by the Church and its members (despite our limitations, flaws and sins), will provide those who seek God with grace-filled opportunities to encounter Jesus, whose life, teaching, death and resurrection makes the Truth, Goodness and Beauty of God visible, accessible, transformative and ultimately salvific. It was in that spirit last summer that I applied (along with 58 other Alaska artists) for a Solo Exhibit at the Alaska State Museum. Along with seven other artists I was chosen to have an exhibition which will run from February 2nd until April 8th, 2018. It will be a retrospective exhibit of almost forty years of my work as an icon painter and I’m already in the process of asking churches and individuals for the loan of the work I have done for them over the years to show in the exhibit. In addition to the great honor of being selected, such an exhibit of icons is also a beautiful and opportune way to “proclaim the name, the teaching, the life, the promises, the Kingdom and the mystery of Jesus” to all those whose hearts are open to him. It so happens that God has given me the ability to draw and paint icons, but each of us has a gift or gifts that enable us to share with others, in the most public or private of settings, the saving mystery of Jesus in all of its truth, goodness and beauty. As we renew our baptismal promises this Easter and throughout the Easter season, it’s worth taking the time to identify and discern the unique way in which we can evangelize others in the particular situations that God has placed us as missionary disciples.